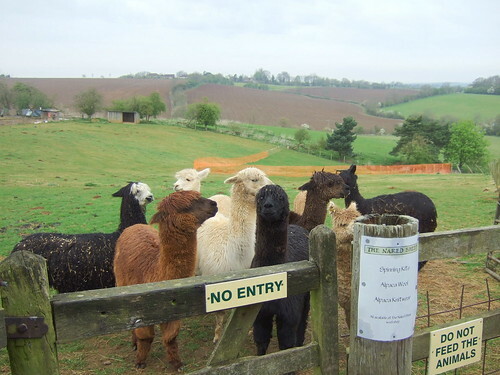 I have decided to end the Without Seams blog. Over the past few months I haven’t really felt like posting updates. 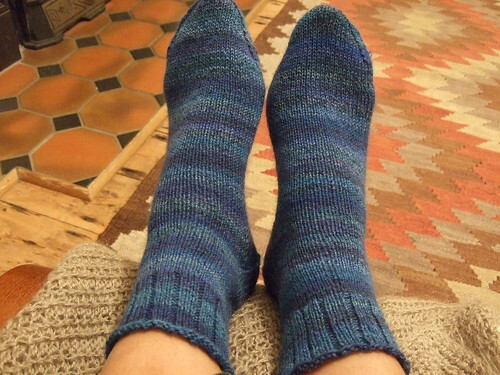 I tend to keep my project page on Ravelry up to date, and it feels like an extra chore to keep the blog up to date – I suppose that after two years, blogging has lost it’s novelty for me! 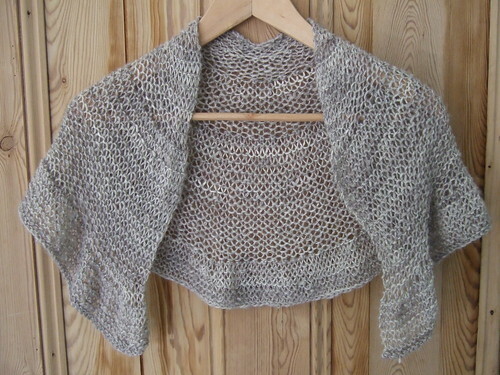 I will be moving all the patterns over to Ravelry over the next few weeks (my Ravelry username is milobo), so if you would like any of the patterns, you should either download them now, or you will be able to find them over there if you have an account. October has been my finishing month. 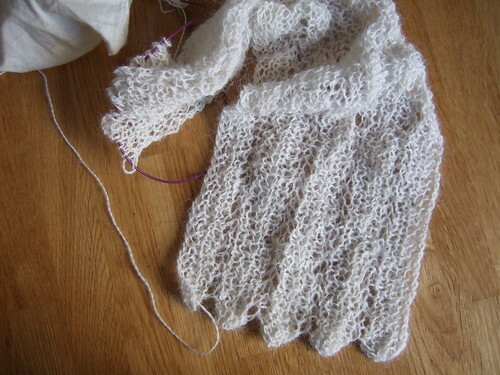 I finished spinning the Jacob yarn (see above), and decided to make a Lacy Baktus scarf -really pleased with it, and have already worn it quite a lot, although the yarn is slightly itchy. 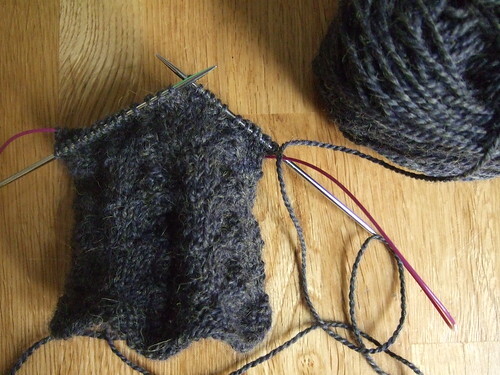 There have been quite a few unfinished projects languishing in my yarn basket over the past few months. 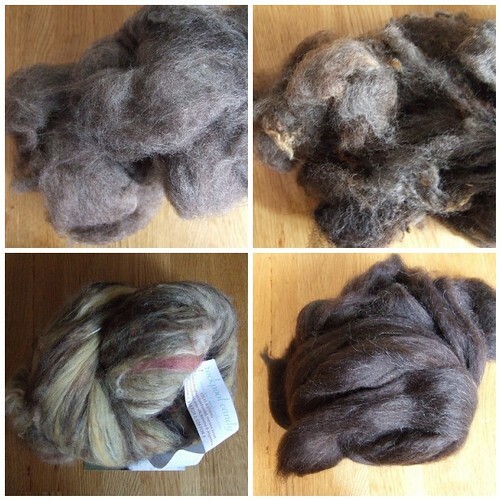 A couple of weeks ago I decided to have a clear out – mainly to make room for new fibre I bought at the IKnit day in September and the Knitting and Stitching show earlier this month (see below). I decided to be fairly ruthless, and commit to finish a few before starting another project, or get rid of any project that I don’t really like anymore. 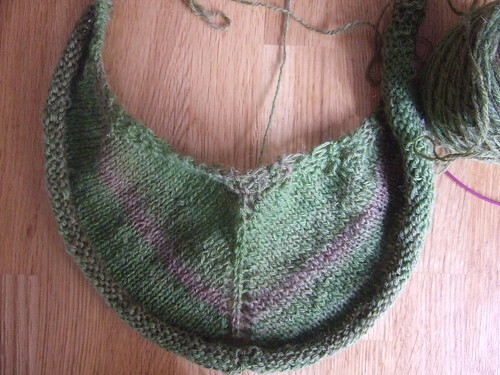 I ended up frogging a couple of things – the flared lace smoke ring, which according to my Ravelry page I started in December 2007 ( I decided I would never wear it) and the Green Liesl cardigan (really don’t like the colour at all – the yarn had gone to a charity shop). 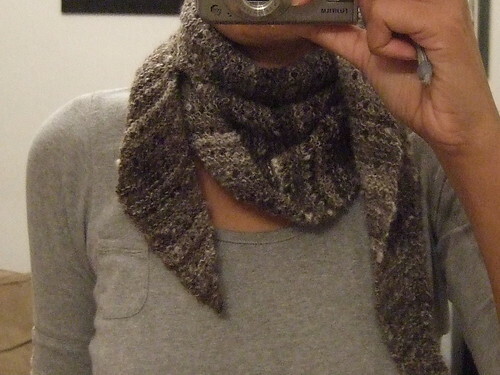 I also decided to frog the crochet alpaca lace scarf as the yarn didn’t really fit the pattern. 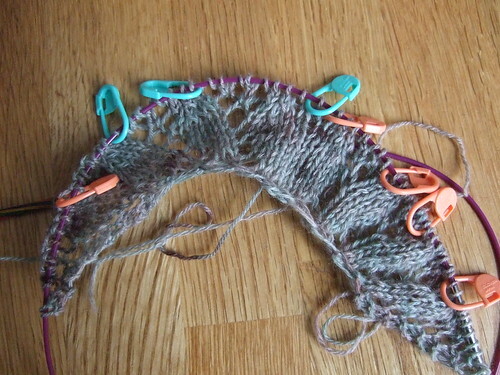 I am now using the yarn to make the Luna Lace scarf from the Shear Spirit book. 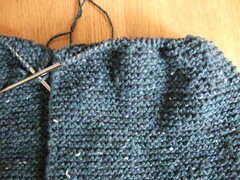 The pattern doesn’t look like much on the needles, but I’m sure it will look really nice after blocking. 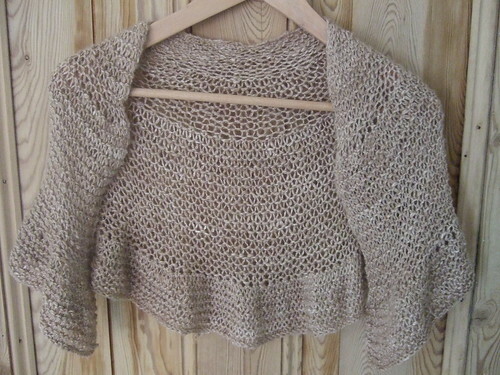 and my bog jacket – pictured here before blocking. 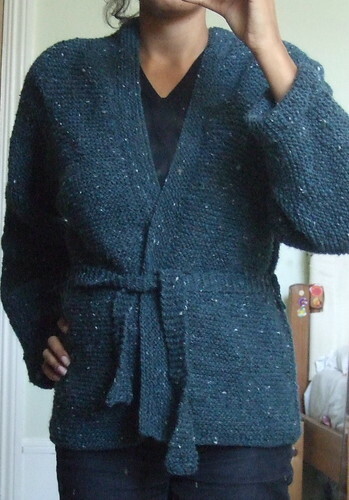 I decided to add garter stitch front bands and a belt instead of the applied I-cord. 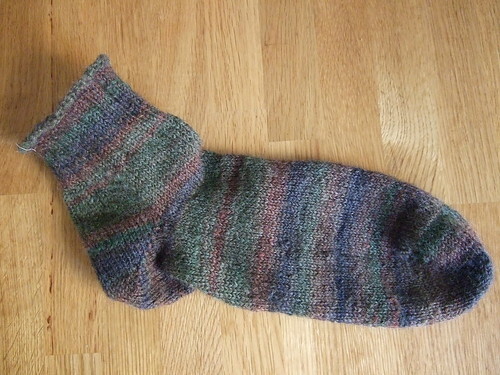 I quite like it, but wish I had used larger needles for a lighter, less dense fabric. 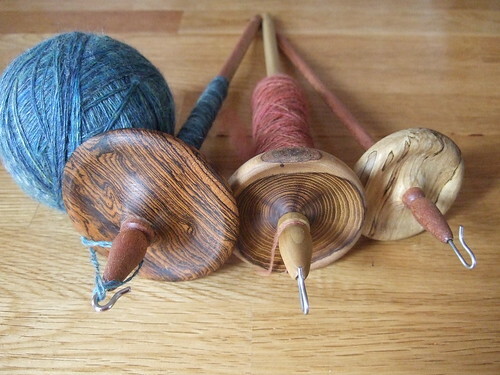 We don’t live near a spinning wheel outlet, but I had planned to visit P&M woolcraft on the way to visit my parents at Easter to try a few wheels. 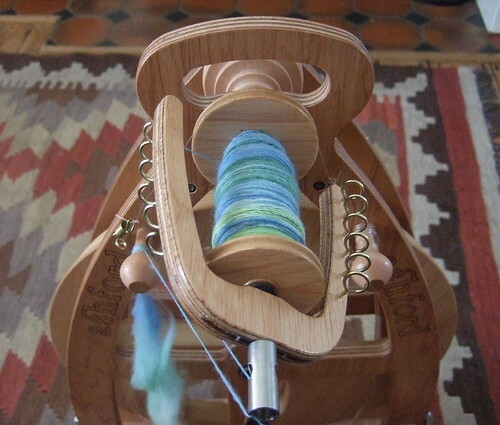 Unfortunately, I couldn’t wait that long, so I went ahead and bought the wheel I always thought I would buy – an Ashford Joy double treadle, mainly because I liked the way the wheel looks, and also the compact size. I know these are not the best reasons to choose a wheel, but I am alsolutely delighted with it. I find it easy and comfortable to use. 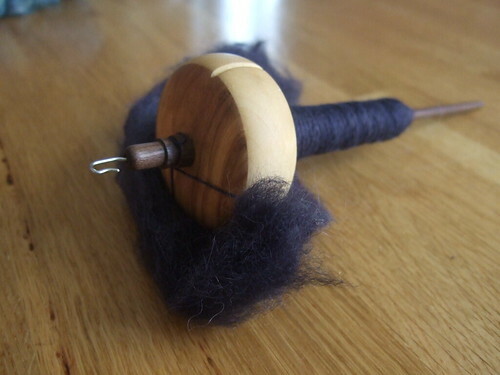 It doesn’t get in the way when not in use (it fits neatly under my computer desk when folded), but when I want to use it, it only takes a couple of minutes to get it out and set it up to start spinning. 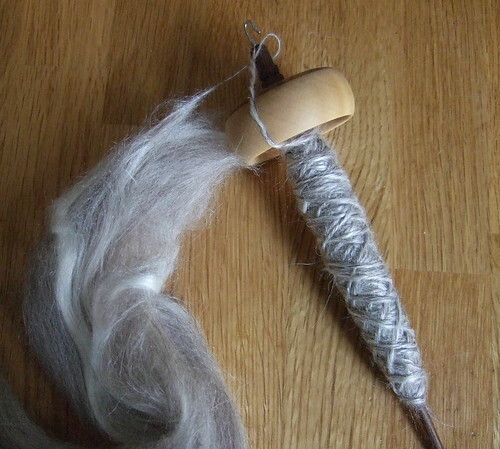 When I bought my wheel (from Wingham Wool Work – great service), it came with a £25 fibre voucher, which I used to buy a variety of fibre to practise on. 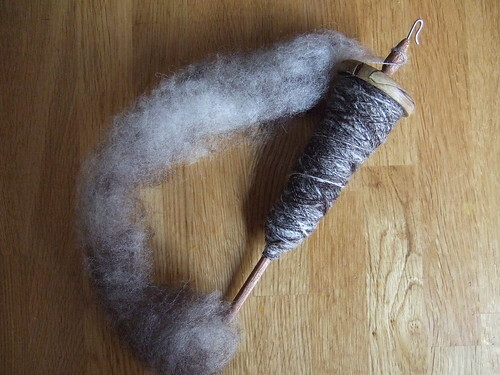 I’m really enjoying wheel spinning. 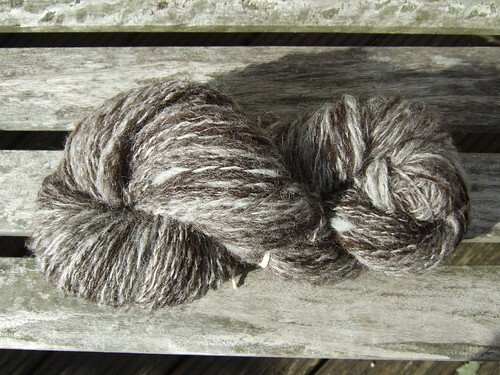 I’ve already completed my first wheel spun project – a storm cloud shawlette using a two ply camel /silk blend spun from fibre bought with my voucher. 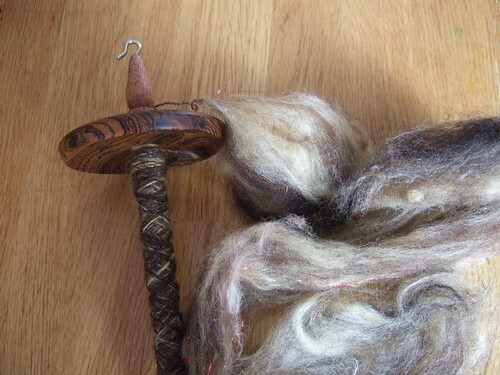 The camel/silk was easy to spin once I got the hang of it. 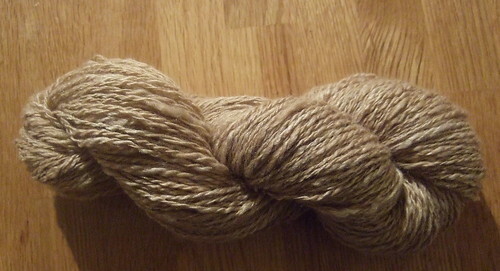 The finshed yarn was lovely and soft, and although not very consistent, about 14 wpi. 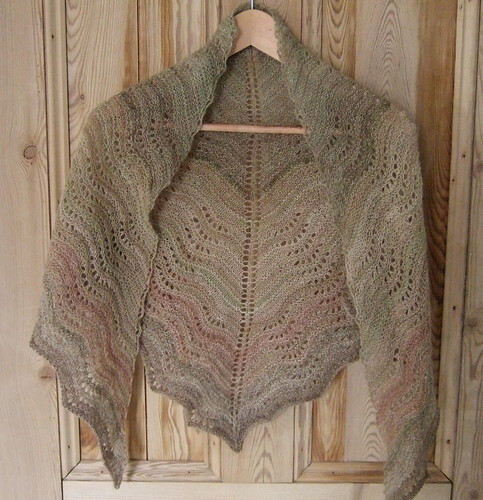 Here is the finished shawl – a nice, quick and easy pattern. I would definitely make it again. 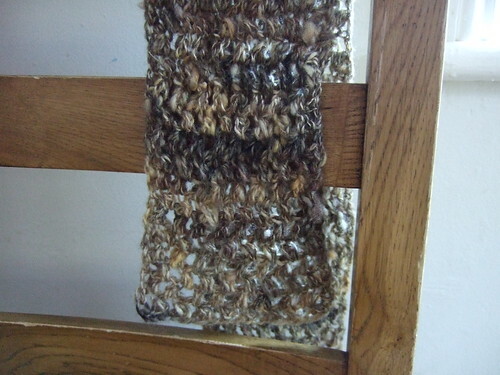 I’ve also spun up the rest of the green hand dyed fibre I used for my crocheted cowl. I’ve got about 400 yards about 16 – 18 wpi. 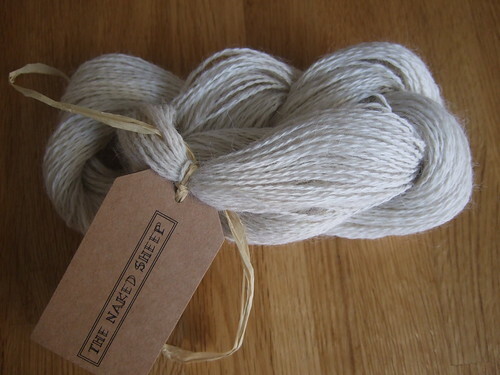 I’m using this to make an Ishbel shawl.